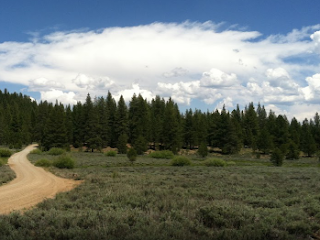 THPBlog: Sierra Pacific Industries to clearcut log SE of Quincy, CA. Sierra Pacific Industries to clearcut log SE of Quincy, CA. This THP is about 14 miles SE of Quincy, CA and about 1.5 miles east of Cromberg, CA and Highway 89 at an elevation of 4,285 to 5,300 feet. Sierra Pacific Industries is planning a mostly clearcut tractor and cable logging operation on steep and unstable slopes in Douglas fir, white fir, incense cedar, ponderosa pine and sugar pine forests. There are 7 landslide terrain sites in the THP area including; 2 unstable areas outside of THP units, a fill slope failure in unit 204, an eroding slope in unit 205 from historic hydraulic mining, a debris slide in a plantation, and 2 dormant slides in and adjacent to unit 202. SPI is planning to use ground based equipment in areas designated for cable logging. 21 road drainage sites are planned for work including rocking, dip construction, ditch cleaning and culvert repair/replacement. Quincy lupine was found in sections 7, 14, 17, 19, and 24. There are 2 spotted owl nesting territories within 1.3 miles of the THP area.